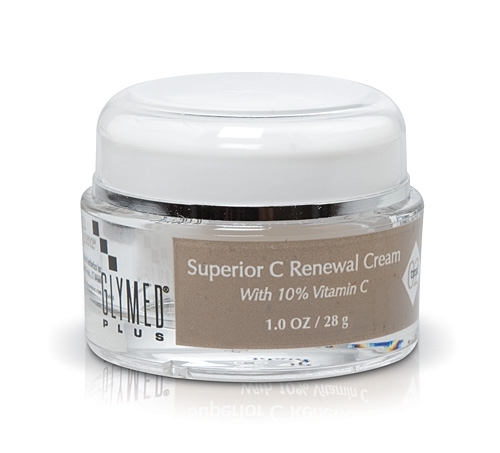 GlyMed Plus Cell Science Superior C Renewal Cream 1 oz available now at BeautyStoreDepot.com. A velvety moisturizer and make-up primer with 10% vitamin C.
A potent and natural combination of vitamin C with lipid-soluble vitamins A and E that assist skin cells to accelerate the production of collagen and repair cellular damage caused by daily UV exposure. Ascorbic Acid: Vitamin C is considered the most important water soluble anti-oxidant and acts as a free-radical scavenger. Tocopherol: A powerful antioxidant and soothing agent that protects skin from the effects of pollutants and free radicals. Helps maintain and strengthen other anti-oxidants in the formula and in the skin, while at the same time acting as an anti-aging ingredient. Retinyl Palmitate: A primary anti-oxidant, free radical scavenger and cell renewal ingredient. Acts as a skin normalizer with the ability to either moisturize dry skin, or reduce excess oil in the skin. Apply to entire face area and down the neck. Use under makeup to fill in fine lines for a more smooth application.